Please note that Buckfire & Buckfire P.C. is not accepting cases for student bullying. Recent case law in Michigan has made it extremely difficult to win this type of lawsuit against a school system or school employees. The content below is for informational purposes only. We sincerely regret that we cannot pursue this type of case for you or your child. October has been designated as National Bullying Prevention Month. In honor of that, the Michigan personal injury attorneys of Buckfire & Buckfire, P.C. are re-releasing their “Student Bullying in the United States Statistics and Facts” Infographic. The infographic displays the facts and statistics about student bullying in our United States school systems. Buckfire & Buckfire, P.C. created the infographic to make aware that student bullying in our schools is not only a serious issue, but very prevalent in our school systems as well. Some of the visuals on the infographic include two maps of the United States, one classifying which states are the worst to live in for bullying K-12, and one classifying which states enforce bullying laws, as well as other helpful visual aids. The infographic was originally released in April 2011 and has had over 5,000 unique views on the Buckfire & Buckfire website. In addition to all of the views on the firm website, over one hundred websites have placed the graphic on their own websites for their visitors and others have used the PDF version of the graphic to print posters for display in their schools. The firm is proud that its creation of the infographic has helped educators, social workers, and governmental agencies in their anti-bullying education efforts. To learn more about student bullying and to view the full image of the “Student Bullying in the United States Statistics and Facts” Infographic visit http://www.BuckfireLaw.com. Near the bottom of the homepage you will see a link that will directly take you to the infographic. • 280,000 students are physically attacked in secondary schools each month. • 160,000 students miss school each day for fear of being bullied. • Every seven minutes a child is bullied on a school playground. • One out of four students will be abused by another youth. “People need to be aware of not only the dangers of student bullying, but also how common it is in today’s school systems. In fact, with social media sites, such as Facebook, becoming more popular and prevalent in our daily life, cyber bullying is also becoming a large channel for student bullying. If people are not aware of the issue, they will not take action. That is why we created the Student Bullying infographic, in hopes to help educate the public on the seriousness of this issue,” says Daniel Buckfire, Partner and Trial Attorney at Buckfire & Buckfire, P.C. 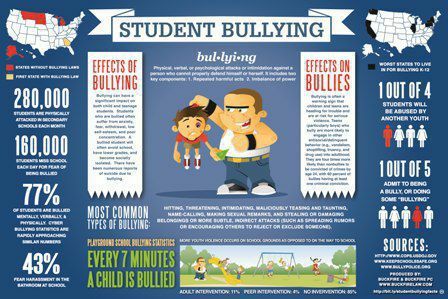 “The Student Bullying in the United States Statistics and Facts” infographic was designed to educate the public student bullying. To help others become educated and more aware of the issue, share the infographic by embedding the graphic on a website, emailing friends and colleagues, and sharing on all social media sites such as Facebook, Twitter, and Google+. The infographic is licensed under a Creative Commons Attribution-NoDerivs 3.0 Unported License. Buckfire & Buckfire, P.C. asks if you share the infographic to please include the source of the infographic: https://www.buckfirelaw.com/ – Michigan Personal Injury Attorneys.